HIS shows off its Radeon HD 7970. 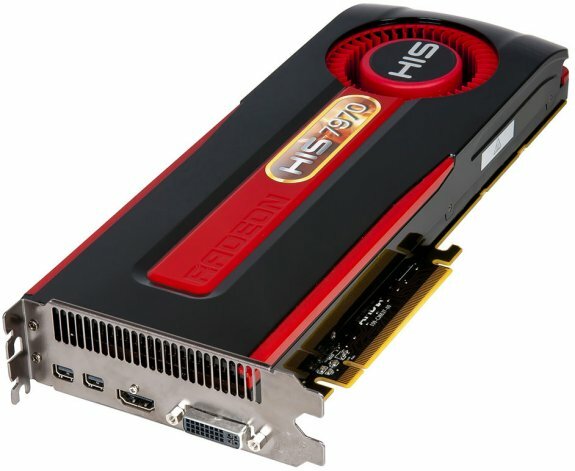 Hightech Information System (HIS) today announced the launch of HIS 7970 3GB. The card is the world’s first 28nm GPU graphics card, pushing the graphics experiences to an unrivalled level! With a clock rate of 925 MHz, memory clock of 5.5 Gbps as well as a 384-bit memory interface, this new 7000 series HIS 7970 3GB offers maximum and crazy performances! HIS 7970 3GB comes in a great value with the bundled the Eyefinity Dongle – the Active Mini DisplayPort to SL-DVI Dongle. In addition, the bundled HIS Weight Lifter makes the card last longer. It takes some weight off of the card and the PCIe slot, providing a simple but effective solution to prevent potential damage to the card due to the card’s weight. The new architecture of the card gets more usable processing power for your money, enabling better frame rates in the latest games at high resolutions. In addition, with AMD PowerPlay & AMD PowerTune technologies, you can optimize the balance between performance and power consumption of your system by adjusting the engine clock during runtime of the card. Manage the power and keep your wallet loaded.